The sweetly scented yellow flowers of the Ozark Sundrop are 4-5 inches in diameter. The lance-like, light green, 5" leaves are soft and velvety. The Ozark Sundrop is an easy to grow trailing plant that will grow 6"-10" tall and form a 24" clump. This night blooming plant will produce a succession of short lived blooms from late spring until mid summer if the dead flowers are removed promptly. Ozark Sundrops are hardy in USDA zones 5-9. They prefer to be grown in full sun but will tolerate some light shade in the afternoon as well. Evening Primroses grow best in humus rich soil, but will grow well in just about any kind of garden soil as long as it is well draining and does not cake. Feed once in the spring with a good all-purpose fertilizer. 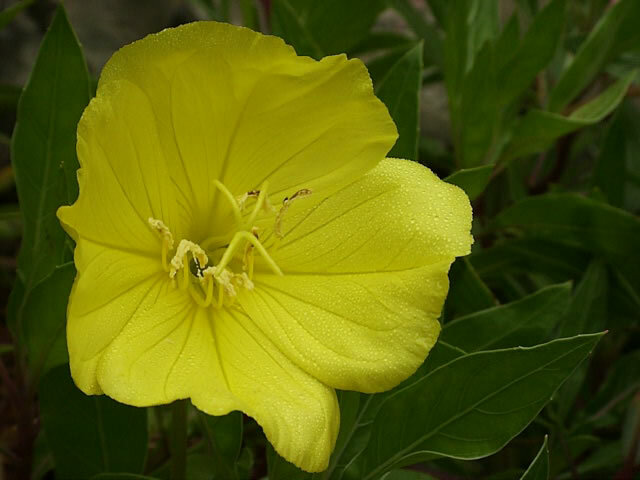 Sundrops are fairly drought tolerant plants once they become established. 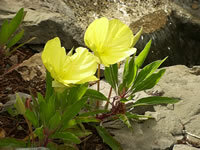 Oenothera plants can be propagated by dividing established clumps in the spring or in the fall. Softwood cuttings may be struck in late spring. Easy to grow Sundrop seeds can be sown directly in the garden in late summer, early fall, or planted early in the spring. Sow Sundrop seeds indoors in a moistened soil mixture in early spring. Maintain a temperature of 68°-86° within the growing medium. Plant 6"-12" apart in the garden after all danger of frost has passed. Oenothera biennis, the Common Evening Primrose produces 5 ft. spikes of yellow flowers that open in the evening. Oenothera rosea, the Rose of Mexico is a low growing plant producing an abundance of 1" pink or reddish flowers that open during the day. Oenothera speciosa, the Showy Evening Primrose is a clump forming plant that produces 18"-24" spikes of fragrant pink-edged white flowers.